Welcome to 2012!!! We have been hearing about 2012 ever since Jose Arguelles brought it to our attention in 1987 with the first world wide meditation, the Harmonic Convergence. Now, whatever is riding in on that wave is beginning to crash upon the shores of our mind. I believe that we have some challenging times ahead but that a true renaissance in consciousness is just around the corner. Today is Jan 24th in Gregorian time. It is Jose Arguelles’ first birthday since his passing on the super moon of March last year. I remember hearing about the news in the OaklandAirport, having just gotten back from an overdue trip to New Mexico. It was hard to understand and process. 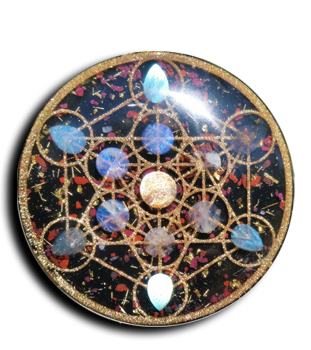 orgone is an art form, which is created from the intelligent organization of materials from the mineral kingdom. The resin, crystals, and metals are organized together to vibrate through time. But what do they vibrate to? This is an important thing to consider. They certainly have a natural vibration to them. The crystals themselves have the ability to change the vibrations of other matter. The work of Marcel Vogel is an eye opening example of this phenomenon. So while working with crystals I consider the “programming aspect” of making orgone very important. There really only two kinds of programming for orgone; healing programming, and fear programming. When you consider these, it is pretty easy to see what kind of orgone you are making. I encourage everyone out there that is making or thinking about making orgone, to examine where they are coming from. I didn’t always see it this way; it took time to understand this. I believe that focusing on the healing aspects of the crystals, brings about the best orgone. More then what kind of metal is used, or how close your ratio of resin to metal is. I believe that the conscious factor is the most important one. When I set out to make some tower busters (which I renamed ESP’s for energetic space purifiers), sending energy to the PTW, is not part of the program. I have no fear of their nasty chem-trails, or disgusting deeds. What they are allowed to do is for demonstration and when it is no longer needed, it will be gone. The days of power being in the hands of a few elitists are over. It is time to create the new emerging paradigm. To do that, we need a vision of a new time. One of the obelisks that I am working on is all about ushering in the new paradigm. That is why it is called the Obelisk for a New Time. The casting of this obelisk fell upon some interesting days in regards to “Time.” I poured the body of it on “Occupy-Yourself” day which was also Calleman’s end date for the Mayan calendar; October 28th. On that day, we had many peoples good intentions sent this way in a collective crystal programming (more of that story is here). The crystal capstone was mounted soon after that on the synchronic return of Pacal Votan’s (most famous Mayan sage). When this obelisk is finished, it will be like an ancient Mayan stella, commemorating the passing of one cycle and the beginning of the next. I make orgone so that they may emit a vibration of healing, unification and purification of the lower vibrations. May we all take some responsibility and do what we can to make this beautiful planet back into a work of Art. The PTW would love see that everyone continue on in their technospheric hell until everyone finally has a chip implanted in them. How tied in too their paradigm do we need to get before we see that it only works when we participate in it? Using their calendar for so long has most everyone completely brainwashed as to how “reality” has to show up. A return to a garden culture with an emphasis on the development of physic technology (based in number) seems to me to be more then a worthwhile vision. Jose lived his life to remind us of this vision and that if we put down our biosphere degrading technology and develop our latent physic abilities, then a universe of galactic intelligence awaits us. I am forever grateful to have the opportunity to make orgone and share it with the world. Many thanks for all the support. These are just some reflections of mine as we continue our journey to a new Time. I look forward to connecting with you in a unified telepathic field. Today is my 8 year anniversary with Roxanne. Our marriage and partnership has been a blessing from God and I am forever thankful for the opportunities that it presents. This has been a pretty interesting week. On the 24th. I learned of Jose Arguelles passing. Some of you may know of him as Valum Votan. He was an amazing visionary who has had a deep effect on me since I first read the Mayan Factor in 1993 when I was 13 years old. 2 years ago this April, through blessed synchronicity, I met Jose in San Francisco. We only spent a couple hours together but for that I am truly grateful. Here is a great tribute by John Kaminski. During the last week of April I will be doing the New Living Expo in San Francisco. If you are in the area I highly recommend coming down. It is always inspiring and invigorating and I would love to meet you! It’s been just over a week since our chembuster arrived and my husband set it up in our back yard. The Saturday it was set up was the first sunny day in recent memory. The following morning the sky was blue and I watched as planes began spraying but the trails dissipated rather than spreading. Awesome! By late afternoon it seemed there were more chemtrails but my daughter pointed out that much of what I was seeing were actually Sylphs at work on them. We have never in recent memory had four days with blue skies and no apparent spraying. B__ says it has to be due to the chembuster. I guess I thought that the chembuster’s orgone energy both transmuted the toxic energy of the chemtrails and attracted Sylphs which also do that. Why would the spraying, which has been daily and constant for years all of a sudden seem to stop? Can you explain any of this to me. I’ve also found myself wondering what happens when we get heavy rain and/or snow and it gets into the copper pipes? Does anything have to be done? Branch, our entire family owes you much gratitude and thanks! Both our children and three grandchildren live in homes adjacent to ours and we can now safely let the children outside to play and swim as the weather becomes warmer! An incredible weight has been taken from us and the beauty of a blue sky and big fluffy clouds are gifts we will never again take for granted again. My husband and I live in Asheville, NC in the beautiful mountains of western NC. We’re surrounded by cellphone towers, which have been bugging me. Even more of a problem, however, has been the near-constant low frequency buzz or hum that’s been bothering us for months.We couldn’t find any information about it online for a long time, but figured out it wasn’t just our house because we feel it in other places around the city [and even in the middle of the Pisgah forest on the Blue Ridge Parkway]. It actually felt like our brains were buzzing down through our necks so much that we had trouble falling asleep every night. Well, I am really happy to tell you that yesterday we received our first order of towerbusters and placed one at each corner of our house and bed (the other four are in the car for now) and our heads haven’t buzzed AT ALL. It is such an amazing feeling to be so clearheaded and able to relax again. I want to buy more already! I’m looking at everything else on your website, too. Asheville is blanketed with chemtrails almost every day to the point where i don’t really want to go outside. We really need a chembuster. We are actually unemployed and extremely cash-poor right now so I can’t afford it, but hopefully soon we can buy one.